PayQwiq now nationwide – 500 free Clubcard points! 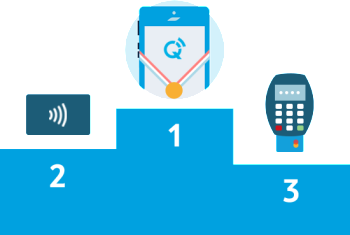 PayQwiq now nationwide – get 500 free Clubcard points for trying it! 15th January was the last day to pick up 500 free Clubcard points with Tesco’s PayQwiq payment app in their Christmas promotion, but don’t worry if you didn’t get around to trying this new paying method. A new offer was launched yesterday letting you earn another 500 free Clubcard points when trying PayQwiq. Until recently you were only able to use this app to pay for your Tesco shopping in around 1,300 shops throughout the UK. This has now been extended to the rest of the UK. Wherever you live, you can now use PayQwiq in Tesco. Tesco is currently offering an extra 50 Clubcard points with each of your first 10 PayQwiq transactions as the Tesco Payqwiq site explains. This offer expires on 7th May 2017 so there is enough time to make the most of this offer. If you want to give PayQwiq a go, take a look at the details of this offer online, download the app and try it out in your local store. There is no minimum transaction size – I have seen reports of people who have bought items for under £1 and still received the bonus. One offer per customer. Offer available only to existing PayQwiq customers who receive this email directly from PayQwiq. Clubcard points will be added to a future Clubcard statement. Only one offer per customer. If you close your PayQwiq account within the first 14 days you will not receive the Clubcard points. Clubcard points will be added to a future Clubcard statement. This probably means that if you are an existing customer you can only collect the 500 Clubcard points if you received the email. On the other hand, if you are new to PayQwiq you will definitely receive the bonus if you sign up. The Tesco Payqwiq page is here. Have they solved the problem yet that you can’t use coupons because scanning the code in the app adds the clubcard and ends the transaction? Really it needs to say on the till – pay now or scan coupons. Just scan your normal Clubcard before going to coupons. The app is aimed at timepoor people to (supposedly!) speed up transactions while recording your Clubcard details. I doubt they’ll sacrifice that for the relatively tiny number of Clubcard related coupons. Hmm, the whole point of payqwik is to save you having to carry your clubcard with you! I don’t think that is the point at all. It’s intended to get people to use a clubcard who otherwise would not have – with the added carrot of saving time. There is a shortcut to the Clubcard app on PayQwiq where you can get a barcode for a ‘normal’ clubcard scan. I think the only time it is actually fractionally quicker than scanning a clubcard and tapping a contactless card is when you have to queue up for the tills and have a hand spare to load up the app and enter your PIN (then wait another 10 secs for the barcode to show up!). If you got the email. I got bonus points way back and another email more recently offering more bonus points. Doesn’t work in Slough Extra. Stood around waving my phone about for 5 mins before giving up. Tried apple wallet, the PayQwiq app, turning brightness to full – no joy. Any suggestions / tips? Don’t hold too close. At staffed checkouts, the operators always start off holding the scanner too close to the phone- i tell them to move it away and it works. Also if it doesn’t work at self-service they can store the transaction and transfer it to another till – well they did that for me during the initial beta, it worked the second time. I received a PayQwik email yesterday regards the national rollout and promptly deleted it. I suppose that was the refreshed offer of 500 points. I’ll certainly have another go as will total 1k points all told just for regular shopping. I too got the nationwide roll out email telling me how as a valued customer I’d be first to hear about their exciting offers blah blah blah! No mention of the 500 points in it though! Ah, maybe that was my downfall, Mike. Read the first sentence and deleted the email. I’ll have a go, nonetheless, and see if the first 50 points credits in a week or two. Will report back. Pleased to report back that I used the PayQwik app twice in Tesco on Sunday and promptly credited with 100 Clubcard points, so no reason why I can’t tick off the remaining 400. That’ll be the easiest 1000 Clubcard points I’ll ever earn, I reckon. First batch already converted to Avios. Tried today in store with scan and shop and just wouldn’t scan the qr code! Assistant said yesterday was crashing tills so had to use normal CC. Not good start! I downloaded PayQwiq last year but had not used it as no Tesco accepted it in West Midlands. Since the 23rd January I have used it 3 times and then suddenly today I received a PayQwiq bonus of 300 points in my Clubcard account! Any idea on how that happened as I thought it was 50 points per transaction?